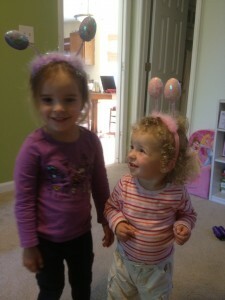 Brooklynn and Olive rockin’ Easter!You can blame me for the headbands. My brother, Timmy, and I shared a room back then and we scrambled out of our beds and ran with our dad to the open window. Our fuzzy, half-awake heads turned towards where he was pointing and still yelling, “There he goes!” and to this very day I can still see the backside of a huge bunny, cottontail and all, rounding the corner of our house. Then my dad turned around and scanned our bedroom. “What a mess!” he said. There were jelly beans everywhere. He shook his head, turning back to his two stunned children before he reached the door. “Oh yeah. Happy Easter!” And he left, unable to hide the big grin on his face. That was 1961. I was five, Timmy was six. And although memory plays some engaging tricks on our minds, I’ve never looked at the Easter Bunny the same since that day. So what does a Big Bunny have to do with Easter? What does Jesus have to do with Easter? Both of them: A LOT. The question is more like: What do they have to do with each other? Absolutely nothing although I can’t help but believe that Jesus would love my father’s playfulness and imagination. I can even see Jesus throwing jelly beans. To satisfy all of you Pagan Police out there, yes the bunny is a fertility symbol. Spring, eggs, bunnies…I get it. It makes about as much sense as dragging a live tree into your house and electrifying it with colored lights. Those pagans must’ve needed something to break up the long seasons. And for my part, being raised by a father like mine, who took every opportunity he could to act like a hyperactive child, I am drawn to celebrations. Especially when they come in the midst of darkness and desolation. So I can’t help but think about two women on a mission almost two thousand years ago. It was a very dark time for the two Marys. Their friend, leader and supposed savior had been brutally murdered on a cross just three days before. It was past the Sabbath and they had come to anoint his body for burial. As they reached the tomb, the earth shook and an angel from heaven appeared. His face shone like lightening and his clothes shimmered in white. As he rolled back the huge stone from the grave, two guards fainted from fear. Then he said this to the two shocked women, “Don’t be afraid! I know you’re looking for Jesus who was crucified. He isn’t here! He is risen!” The book of Luke says, “Why do you look for the living among the dead?” I love that. So they ran and told the disciples who must’ve thought they were crazy at first. But Peter ran to the empty tomb, then left “wondering what it meant.” One thing it meant was that Jesus does just what He says He will do. And it means He is alive, not dead, He has thrown open the doors of heaven for all who follow Him, defeating death and the power of hell on earth. I don’t know how we can pick one day to celebrate all that. I like to start everyday just saying Thanks to Jesus for doing that for us, because I am free and it cost Him a lot. Furthermore, Easter was not a favorite holiday for me as a child because I had to stay in a dress all day and I’d get sick eating all those marshmallow Peeps. Even the smells were gross…hard-boiled eggs, Easter lilies combined with an overcrowded church reeking of Wind Song and Vitalis after shave. I guess that’s why I remember the jelly beans and the giant bunny so clearly. It was unexpected. It was wondrous. It was my father’s best side, a creative, playful love for his kids. I’m quite sure Jesus does not object to Easter egg hunts and chocolate bunnies. He sure likes seeing any family sit down together and share their homes and hearts. But I think He would also love for you to look at the empty tomb and like Peter, just wonder. Could a place as horrid as the cross become a place of rebirth, renewal and life? He is risen, piercing the darkness with His marvelous light. That is really good news. Worth throwing some jelly beans around; it’s better than big bunnies. Jesus rose for you and for me. Let’s celebrate! I did not expect to wake up to the sound of jelly beans hitting the walls and windows. But as I sat up and blinked twice I realized it was true. Jelly beans were scattered across my bed and my father was running around our beds yelling, “There he goes! There he goes!” My brother, Timmy, and I shared a room back then and we scrambled out of our beds and ran with our dad to the open window. Our fuzzy, half-awake heads turned towards where he was pointing and still yelling, “There he goes!” and to this very day I can still see the backside of a huge bunny, cottontail and all, rounding the corner of our house. Then my dad turned around and scanned our bedroom. “What a mess!” he said. There were jelly beans everywhere. He shook his head, turning back to his two stunned children before he reached the door. “Oh yeah. Happy Easter!” And he left, unable to hide the big grin on his face. That was 1961. I was five, Timmy was six. And although memory plays some engaging tricks on our minds, I’ve never looked at the Easter Bunny the same since that day. So what does a Big Bunny have to do with Easter? What does Jesus have to do with Easter? Both of them: A LOT. The question is more like: What do they have to do with each other? Absolutely nothing although I can’t help but believe that Jesus would love my father’s playfulness and imagination. I can even see Jesus throwing jelly beans. To satisfy all of you Pagan Police out there, yes the bunny is a fertility symbol. Spring, eggs, bunnies…I get it. It makes about as much sense as dragging a live tree into your house and electrifying it with colored lights. Those pagans must’ve needed something to break up the long seasons. And for my part, being raised by a father like mine, who took every opportunity he could to act like a hyperactive child, I am drawn to celebrations. Especially when they come in the midst of darkness and desolation. So I can’t help but think about two women on a mission almost two thousand years ago. It was a very dark time for the two Marys. Their friend, leader and supposed savior had been brutally murdered on a cross just three days before. It was past the Sabbath and they had come to anoint his body for burial. As they reached the tomb, the earth shook and an angel from heaven appeared. His face shone like lightening and his clothes were white as snow. As he rolled back the huge stone from the grave the two guards fainted from fear. Then he said this to the two shocked women, “Don’t be afraid! I know you’re looking for Jesus who was crucified. He isn’t here! He is risen!” The book of Luke says, “Why do you look for the living among the dead?” I love that. So they ran and told the disciples who must’ve thought they were crazy at first. But Peter ran to the empty tomb, then left “wondering what it meant.” One thing it meant was that Jesus does just what He says He will do. And it means He is alive, not dead, He has thrown open the doors of heaven for all who follow Him, defeating death and the power of hell on earth. I don’t know how we can pick one day to celebrate all that. I like to start everyday just saying Thanks to Jesus for doing that for us, because I am free and it cost Him a lot. Furthermore, Easter was not a favorite holiday for me as a child because I had to stay in a dress all day and I’d get sick eating all those marshmallow Peeps. Even the smells were gross…hard-boiled eggs, Easter lilies combined with an overcrowded church reeking of perfume and Vitalis after shave. I guess that’s why I remember the jelly beans and the giant bunny so clearly. It was unexpected. It was wondrous. It was my father’s best side, a creative, playful love for his kids. I’m quite sure Jesus does not object to Easter egg hunts and chocolate bunnies. He sure likes seeing any family sitting down together and sharing their homes and hearts. But I think He would also love for you to look at the empty tomb and like Peter, just wonder. Could a place as horrid as the cross become a place of rebirth, renewal and life? He is risen, piercing the darkness with His marvelous light. That is really good news. Worth throwing some jelly beans around; it’s better than big bunnies. Jesus rose for you and for me. Let’s celebrate!